50030 new at Peak Rail October 2002 50030 is seen very soon after arrival at Peak Rail on 5th October 2002. Photo: Steve Townend. The external condition of both locomotives after ten years' storage was frankly terrible and we agreed with Peak Rail that sorting this out and presenting a better external image would be our first priority. 50030 is seen very soon after arrival at Peak Rail on 5th October 2002. Photo: Steve Townend. The external condition of both locomotives after ten years' storage was frankly terrible and we agreed with Peak Rail that sorting this out and presenting a better external image would be our first priority. More 50030 bodywork restoration October 2003 More bodywork restoration on 50030 from 26th October 2003. We were blessed with a mild autumn meaning we could really crack on. 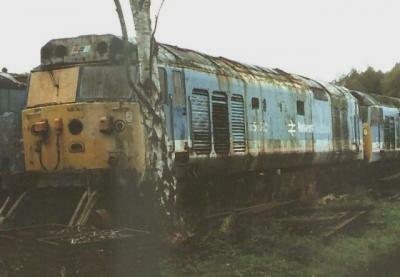 Notice the cab side rot on 50030; a feature of many English Electric locomotives caused by drainage channels from the cab interior becoming blocked over the years. Photo: Paul Taylor. 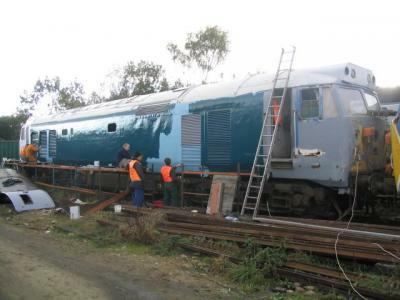 More bodywork restoration on 50030 from 26th October 2003. We were blessed with a mild autumn meaning we could really crack on. 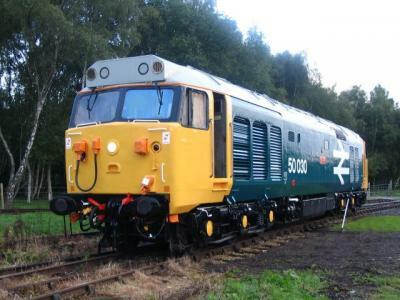 Notice the cab side rot on 50030; a feature of many English Electric locomotives caused by drainage channels from the cab interior becoming blocked over the years. Photo: Paul Taylor. 50030 bodywork restoration October 2003 The lighter shade of NSE blue on 50030 had worn thinner than the darker shade on 50029 and as such Repulse was the first to be tackled cosmetically. In the words of Rolf Harris, "Can you guess what it is yet?" 26th October 2003, photo by Paul Taylor. 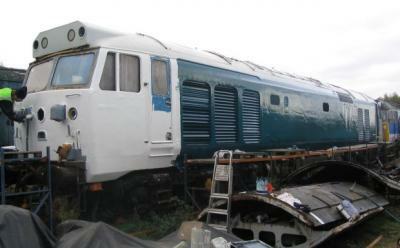 Notice the roof panels in the foreground which are the remains of 50043 Eagle, kindly donated to us by the last owner of Eagle, Paul Spracklen. 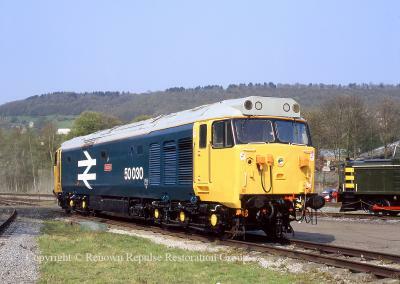 The lighter shade of NSE blue on 50030 had worn thinner than the darker shade on 50029 and as such Repulse was the first to be tackled cosmetically. In the words of Rolf Harris, "Can you guess what it is yet?" 26th October 2003, photo by Paul Taylor. 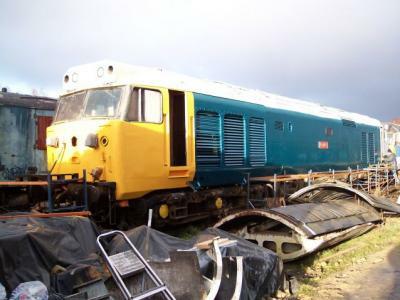 Notice the roof panels in the foreground which are the remains of 50043 Eagle, kindly donated to us by the last owner of Eagle, Paul Spracklen. 50030 bodywork restoration December 2003 14th December 2003 and 50030 is really coming on. RRRG shareholders voted for large logo, a classic livery for the 50s, and replica nameplates were obtained and fitted. Photo by Paul Taylor. 14th December 2003 and 50030 is really coming on. 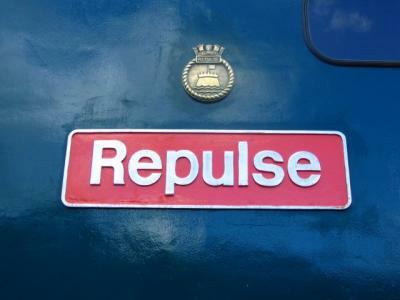 RRRG shareholders voted for large logo, a classic livery for the 50s, and replica nameplates were obtained and fitted. Photo by Paul Taylor. 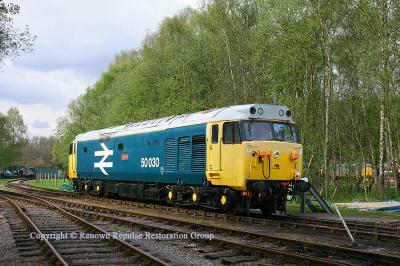 50030 at Rowsley The other side view of 50030 on 8th May 2010. 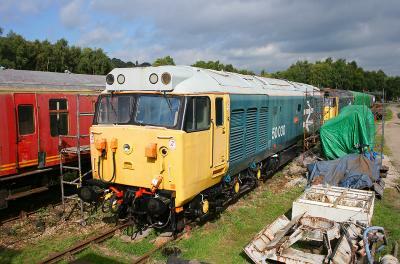 Note that some repainting work was done on the cab front as outside storage had caused the 2005 coats of paint to fade. 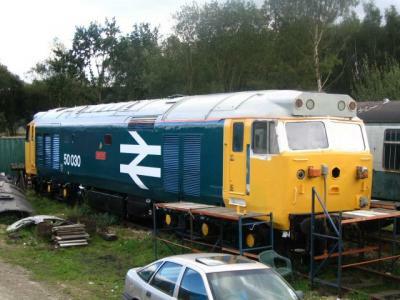 The other side view of 50030 on 8th May 2010. Note that some repainting work was done on the cab front as outside storage had caused the 2005 coats of paint to fade.